As part of our continued commitment to food safety, Lakeshore Technologies is pleased to announce the certification of our facility to the Global Food Safety Initiative (GFSI) recognized FSSC 22000 Certification Scheme. The Global Food Safety Initiative (GFSI) is a non-profit organization that establishes globally recognized food safety standards. It is a business-driven initiative for the continuous improvement of food safety management systems to ensure confidence in the delivery of safe food to consumers worldwide. 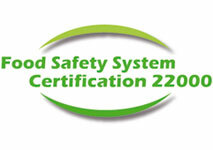 The FSSC 22000 certification scheme was developed for the certification of food safety systems and is based on the requirements of the ISO 22000 Standard and ISO 22002:2009. The GFSI has fully accepted the FSSC certification scheme. To meet the requirements of this certification scheme, Lakeshore Technologies demonstrated the successful implementation and maintenance of a robust food safety and quality management system. This system includes documented programs such HACCP, allergen control, cGMP’s and training. For more information about the GFSI visit www.mygfsi.com. To learn more about the FSSC 22000 certification scheme visit www.fssc22000.com.